Every Viking warrior strives to see their place within the glorious gates of Valhalla. To to be sacrificed or die fighting would be perceived to as a worthy deed to the Gods. This is the tale of Thora, a warrior in her own right, soaked by the wisdom and courage bled into her by her parents. As for her final breath, Thora would not fall quite as gracefully. Yet she has been granted a second chance to redeem herself. A chance to impress the Gods, regain her honour and to be accepted in by Odin’s Valkyries. The trials laid before you usually consist of two mazes, each housing a rune that must be obtained to prove worthy of facing its Jotun. There are five of these colossal guardians to fight, each with their own elemental trait. Take Fe, for example. A 100-foot shieldmaiden with a taste for gold – as does the many dwarfs that follow her. Or Jera. A Jotun of harvest, a flower who is fueled by the very nature that surrounds her. Thora must conquer all, with nothing but a double-edged battle axe that can be swung laterally in swift strokes or anchored overhead with a walloping plough. As you can see, your move set is very limited with only two attack options and a rolling dodge to see you through. You must learn the titan’s pattern with a focused mind, for being hasty will only get you killed and frowned upon. This is because your character is slow in movement, or at least it seems that way within a giant open battle arena when scurrying away from the growing shadow cast above you. However, there are gifts for you to seek, powers of the Gods that can briefly aid you in combat. These are hidden away deep in the trials of Ginnungagap and are easily missed if you fail to pay attention. It is clear to see that the boss battles themselves are the main focus here. They also make way for some incredible, hand-drawn character artwork. The animation just flows beautifully, with an intentional stutter that looks as though they are coming to life through the pages of a flipbook. As for the battles themselves, they provide a difficulty that’s challenging but easy to learn. It all plays out in a very traditional manner of remembering sequences and timing actions which may certainly be a safe design choice, but one that works fittingly well enough on this occasion. Besides the lengthy loading screens, I never really got tired of restarting a boss battle. Just watching the animation of Hagalaz, the thunder Jotun, twist and turn into shape from his slumber always gave me another opportunity to study the sketchy lines at work. The backgrounds too are wonderfully crafted, complimented with some nice camera work to pull you into the essence of it all. A good example of this is seen in a maze where you run along the branches of the giant Yggdrasil tree. It’s a simple trick of the lens, but one that leads you to believe that you are gaining incredible heights above land. The mazes accessed through the purgatory overworld of Ginnungagap are healthy in variety and design. You can easily get lost in these mythical lands which will definitely frustrate some but will very much intrigue others. They’re set out to provide a build up for the battle ahead, without the need to throw countless enemies in your direction. In fact, a lot of the dangers found in the mazes are usually either environmental or hide a single stalking presence looming over you. There were a few moments where I felt things didn’t blend quite as well together. Despite presenting us with gorgeous backdrops, there’s actually very little interaction with the environments. This does break the magic of the world slightly as it soon becomes obvious that the majority of the landscapes are just giant static images mounted behind the characters. The visual flatness of it all can become a bit more of a problem when it comes to understanding the distance and perspective of certain structures. I sometimes found it quite difficult to differentiate whether or not the ground that you are trying to walk to is even on the same height as the ground that you’re already standing on, which, in turn, can make the maze-like stages even more confusing and somewhat frustrating. However, what is on point is the sound design. It all fits so well with the source material that you feel like a Viking warrior earning your place. What makes the immersion even more believable is how Thora keeps you hypnotised between sections as she unveils more of her past in her native tongue. Combine that with the sound of some epic boss music and you have everything you need to motivate you on a Jotun hunt. Jotun: Valhalla Edition a short but memorable experience. The art style and animation alone stand out tall and proud amongst the ruckus of the indie scene. At its core, it is a game that does repeat traditions and repetition both in gameplay and pace that some may find a little tedious. But, as for myself, I found it quite difficult to put down. 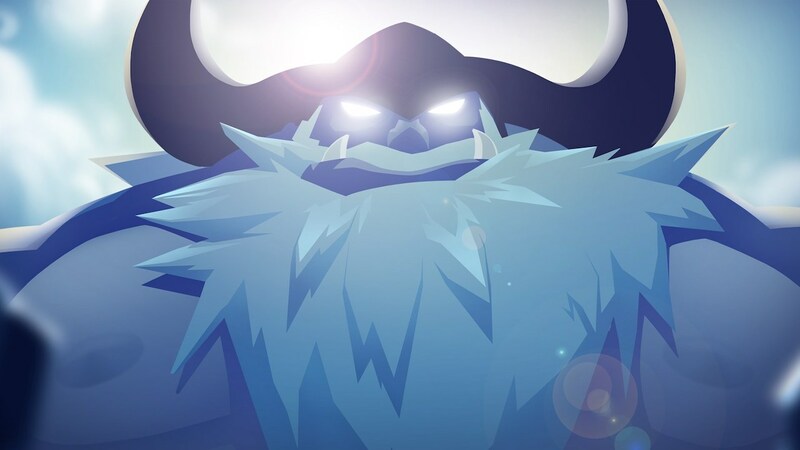 There would often be times where all I needed was one more strike to down a Jotun, only for it to bury me in the ground and punish my impatience. It was within these subtle moments and lessons learned that kept me willing and invested until the very end.